I'm grateful the cherry and magnolia trees are in bloom. It's a treat to come across the beautiful pink and white blossoms as you drive around the city. I'm grateful I had so many hits on yesterday's blog post. I'm not sure why I did, but I'm grateful! I am grateful for the sunny evenings we've been having. There's been an odd pattern over the past three or four days where it's cold and grey during the day and then right around supper time the sun breaks through and gives me a little lift. I am grateful for the inclement weather this weekend because I spent it catching up on my housework. I am grateful my home printer had enough ink in it to print out my latest version of the memoir. It was just getting too time consuming to scroll through almost 300 pages of text. There are definite advantages to a hard copy. I'm grateful to live in a country where so many of our basic needs are met. It's not hard to take them for granted - abundant food, clean water, shelter, home heating, and electricity. I'm grateful my family can afford these things and can donate time and money to help those less fortunate. Thanks so much for your kind comments Phil! I always love to hear what people think. 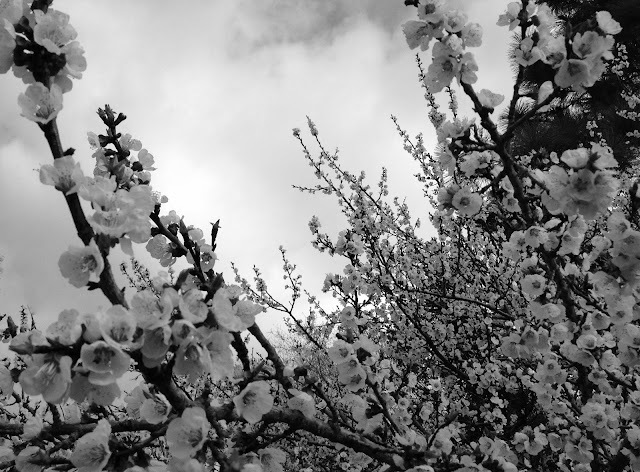 I'm hoping to post a colour photo of that cherry tree this month. It's in front of a beautifully weathered garage, (which might make for a lovely b&w too! ), but I haven't had a chance to get back to that part of the city. Soon I hope!